This month couldn’t be any busier for my little family. The semester is winding down and honestly it felt like it went by extremely fast. 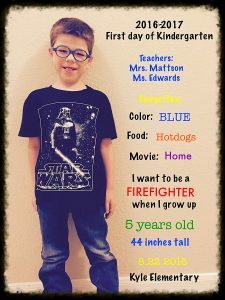 It seems like it was just August and my little kindergartner was off on his first day of school. My how far he has come in these last few months. When he started he was unable to write his name independently and now with the help of wrist weights he is doing fantastic! He is able to identify some of his ABC’s and do some basic math. He continues to strive to articulate his words so everyone can understand him. With the amazing work from his teachers he’s getting the hang of his sight words and can read starter booklets. His Daddy and I are so proud of him. We can’t wait to see what 2nd semester has in store for him but until then it will be nice to have two weeks off of work to spend quality time together. This month has been crazy busy, wait…our days are always crazy busy. Linden has six private therapies a week, horse therapy and swim lessons. He is one busy kid and due to this he is…..relentlessly tired, always. My husband and I talked about scaling back his activities but finding something that we think can take the hit is proving to be difficult. Each of his activities are crucial at the moment. You see, Linden is on the cusp of some major breakthroughs. His muscle strength and balance are really working together right now. I foresee some big steps happening soon. Also he is really trying hard to make his voice heard and understood. His word and sentence structure is becoming more complex. These signs make us think that perhaps the tiredness is worth it for now and whenever possible, naps will fit in. Christmas is right around the corner and thankfully we have completed all of our shopping. We can focus on being together and soaking in all the holiday season has to offer; twinkling lights, sweets, music and movies. We had the opportunity to go to a special needs Christmas party yesterday at Dell Children’s Hospital hosted by Casey’s Circle. They are a non-profit organization finding ways to improve the quality of life for medically complex children. It was great to be able to celebrate our children’s lives together and feel 100% comfortable as parents. There were no stares or questions. It was families being families in a safe no judgement environment. They gave each child a Christmas blanket and presents. It was so awesome! Linden had a blast eating cookies, making a snowman picture frame, a candy cane elf and meeting Curious George. We are so thankful for events like these. Also during this weekend we had my husbands fire station holiday party. The guys and their girls along with the kiddos got to together for a feast, gift giving and games. The kiddos seemed to have more fun than the adults. We encouraged the kids to help us play “White Elephant” by picking out our gifts and unwrapping them. I scored an Amazon gift card! I’d say I would spend it on myself, but who am I kidding. Ha! Linden got a really cool Star Wars Death Star light. When you light it up it makes the room look like it’s full of stars. Pretty neat! All in all, I’d say the weekend went pretty great! Even though it was a busy one, I’m glad we all got to spend it together. Soon we will be doing family Christmas and I can’t wait to tell you how Linden likes his Santa gifts. Until then thanks for stopping by and feel free to share my blog and Facebook page with your friends and family. Phew, what a busy Sunday but it was so much fun! 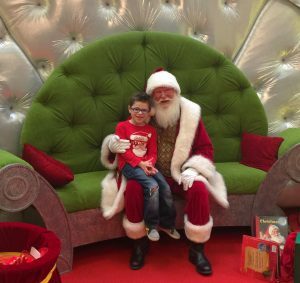 Barton Creek mall in Austin offered special Santa time for special needs kiddos this morning. 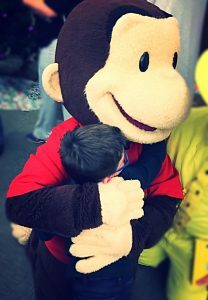 You sign up for a specific time so no need to have to stand in line with your kids who can’t handle the crowds, noises or over stimulation. This worked out perfect for our Linden. Keep an eye out for it next year. Linden also made some new forever friends today. William and I met a couple at the CPATH gala back in October. They have twins and one has cerebral palsy like Linden. 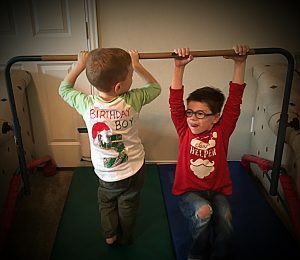 We arrived early to their house before the birthday so the kids could meet. It went beautifully! It was awesome as a mommy who tends to get stares from other kids and parents. This group must have been used to it because of the birthday boy. It felt great to have him fit right in. I wish this was the case at all birthday parties we went to. People mean well and the innocence of curiosity from kids melts my heart. To be a kid again when everyone was viewed the same and fit in the same. There were no boundaries or restrictions. No judgement or bullying. For now I will relish in the present of Linden’s peers innocence and pray their parents raise them with love, kindness and acceptance. I invite you to leave comments on what your child is asking for for the Holidays. Also please feel free to leave your feelings on acceptance of your child in a world of abilities.